On December 1, the Secure Client Area will undergo a major update with a new design and multiple new features. 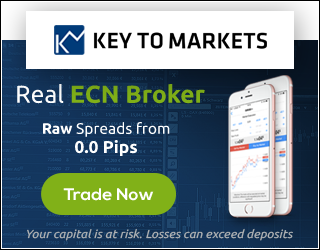 How to deposit on the trading account. From the menu on the left click on “Funds” and “Deposits funds”, in the page that opens you will have to select the payment method and the account to deposit. Alternatively, from the “Account overview” window under the “Account” menu, you can click the “Deposit” button on the right of the desired account. How to withdraw from the trading account. To withdraw funds from the trading account you have to click on “Withdraw funds” from the “Funds” menu and select the wallet (wallet) on which to withdraw the funds. In case it is the first time you make a withdrawal, click on “Insert new Wallet”, from the page that opens, select the type of Wallet you want to insert (bank account, Skrill, Neteller), enter the required data and send. The status of the Wallet will be set to “pending” until it is approved by the financial department, but you can still make the withdrawal request even with a pending wallet. Once you have created the new Wallet, you can return to the withdrawal page and make the request. The advantage of using wallets is that the details of your account will be saved and you will not need to enter them again each time. 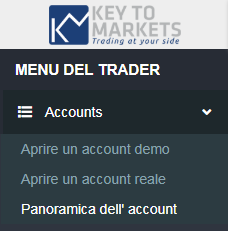 To open an additional trading account click on “Open a live account” from the “Accounts” menu. How to open a support ticket. 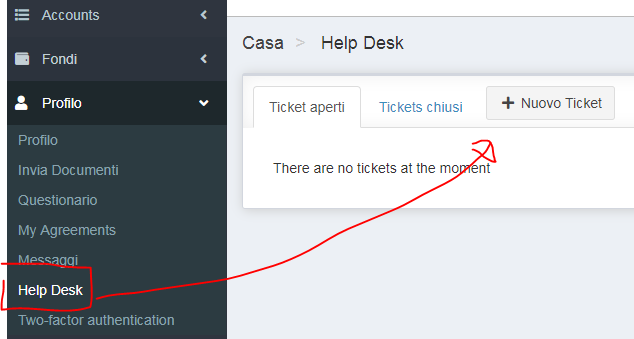 To open a service ticket, click on “Help Desk” in the “Profile” menu and click on “New Ticket”. You will receive the answer both by email and in the personal area. 1) Possibility to change the MT4 password directly from the personal area. 2) Possibility to activate / deactivate the daily reports of the MT4. 1) Demo accounts can now be opened and displayed directly in the customer area. Demo accounts can be opened from the bar on the left under the “Accounts” menu and can be viewed in the “Account overview” section. In case you have registered for one or more demo accounts with the same email address of the real account, they will appear in the personal area. 2) You can deposit in your demo account by clicking on deposit. 3) The customer area will also be available for those who do not yet have a real account.